aisha and adam have a long, fraught history. it started when aisha was on talk soup and became obsessed with a brilliant little adult cartoon called sealab 2021, which featured characters from 70s eco-cartoon sealab 2020 doing terrible things to each other, themselves, and a mop handle dressed like a fashionable lady.flash forward. 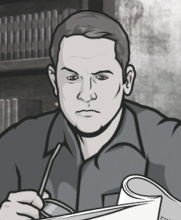 aisha and adam now work together on a brilliant little adult cartoon called archer. the animation is light-years more elegant, the characters sexier, the dialogue smart and earhole-burningly raunchy. the characters still do terrible things to each other and themselves. and unfortunately for cyrill figgis, the mop handle is still around… and she ain’t so fashionable anymore. join adam and aisha in this supersized episode as they discuss corporate embezzlement, booze’s critical role in the creative process, adam’s alarmingly feminine hotel room habits, and the global appeal of the hand puppet. and adam unspools an epic self-inflicted wounds that will make you feel better about all of your life choices up to this point. plus, adam and aisha make up a new word, and aisha insults the swiss. take that, switzerland.